The situation is all too familiar. Two adults are talking and a child needs to tell their mother something. Even with polite words, the parent is being interrupted. It can be hard to focus on either conversation AND be an effective listener when your thoughts are continuously interrupted. There is a great opportunity here for a child to show respect and honor to their elders by properly knowing how to interrupt a conversation. Several years ago I took a parenting class called Growing Kids God’s Way which taught a solution I have recently reintroduced to my children. It’s called The Interrupt Rule. Here’s how it works: When two adults are talking and a child needs to interrupt, they simply put their hand on their parents arm or shoulder. The child waits patiently without speaking. By maintaining contact, the parent knows the child has a need. The parent can touch their child’s hand to acknowledge its presence. The parent can continue in their conversation until there is a natural pause or good moment to address the child. ” Thank you for waiting Palmer, what can I help you with?” The child’s needs have been met and were addressed with undivided attention at a moment determined by the parent. I also have been known to hide in my closet when talking on the phone to avoid being interrupted; so I have implemented the Interrupt Rule when I am on the phone. My children don’t wait forever, but this gives me a few moments to finish up my conversation before shifting gears. 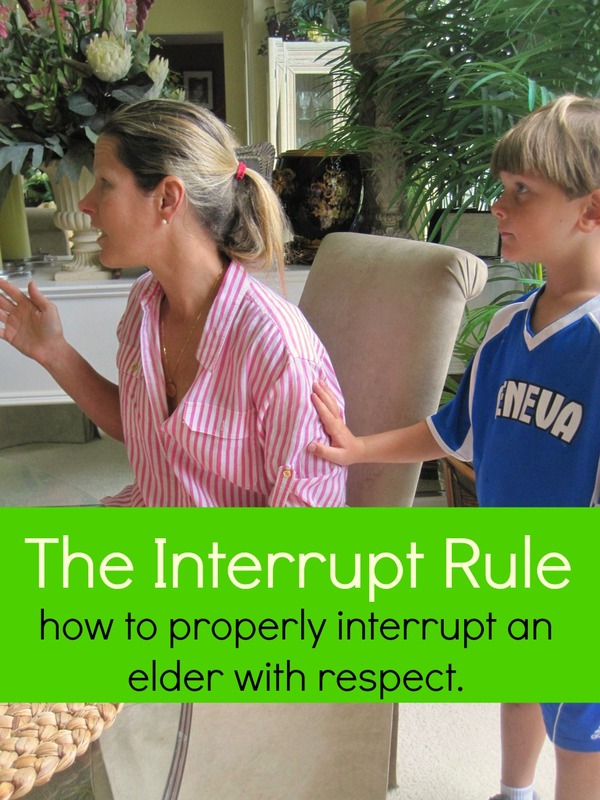 In addition to the obvious lesson in patience, the Interrupt Rule teaches children to honor and respect their elders and the conversations amongst them. This entry was posted in blog, kids, Motherhood and tagged character-building, parenting. Bookmark the permalink. This is fascinating. I’m going to try it with my 4 year old, who interrupts me and my husband constantly. Thank you! This is actually the same way I was taught. Now I’m 25 and I still do this with my husband when he’s talking to a customer while we’re at our business. When I was a child the only time I was allowed to break this rule was if there was an emergency, and that’s the only time I do it now, too. I saw a friend use this with her kids. I really like it. Thanks for sharing! BTW…I found this post through Pinterest. So simple! LOVE IT! I am going to try this with my near 3 year old who repeats the word over and over until you finally say it too. This may just work! Oh my I thought I was the only one whose 3yr old did the same…. Great idea! Thanks for posting this! Thank you! That is something I didn’t know how to handle w/ my 4 kids – so simple! How old were your children when you started this? I have a year old granddaughter and I want to tell my daughter about this. We started it when my daughter was 3. It fizzled out after a few years later but we have recently reintroduced it. I was wondering the same thing. My grand sons are 16 and 20 months old and naturally they haven’t been taught about interrupting. I hope they aren’t too young too implement this technique, it is amazing! It not only, and most importantly, teaches the child respect, it also saves that awkward and sometimes embarrassing moment for the parent when you child is repeating, “Mom, mom, mom” never-ending. Thank you very much for sharing such a thoughtful parenting technique. I learned as a kid to always say excuse me mom. Now as an adult I touch my moms shoulder or whoever I need to get the attention of. I never learned to do that it just became a new behavior. I love this idea better because you can acknowledge them with screaming. I plan to implement this in our kindergarten classroom! Love it; thanks for the idea. Great idea. How bout when you are all in the car??? This is out newest struggle! We still struggle with that one! Everything feels louder in the car too. Let me know if you find a magic cure. Oh my goodness! I love this. My girls think if they say excuse me several times they are being “polite” and can go ahead and talk on and on, even though, I stress waiting until the adults stop talking to say excuse me. I’m implementing this rule ASAP! Thanks for the post! Thanks for this reminder. I am familiar with Growing Kids God’s way and believe in it! I’ve been trying to teach this to my 4 year old and our success rate so far is about 50%. I have also told him that it is only an “emergency” if someone is being hurt, is already hurt, etc…in which case he should yell out “emergency”. Our main problem is he interrupts me when I’m talking because he wants attention and will tell me something silly or something I do not need to know. (to cbgrace) -Ma’am, please don’t disregard a young child’s want for attention because when they stop wanting it that young that is when a serious problem has occurred. Please remember that what an adult sees as silly or unneeded a child sees as important. Anyway, I know I don’t know you and you don’t know me. I don’t know your family dynamics or anything, so feel free to take this as a grain of salt. These are things you could try to back-up The Interrupt Rule. 1) Possibly, tell him and remind him frequently when you’re not with friends or other people that this is the best time to tell you his silly things and “unnecessary” information. Questioning him, when you’re free, will let him know you’re interested in it. Let him know that you enjoy hearing what he says, then let him know that there are good times for it and bad times. Give examples of both each time they come up. 2) Possibly even setting up one-on-one time to just sit and talk about all the funny things he has to say, so that he knows there is a special block of time for you and him to just spend together. It might let him realize that he can save it for later and tell you then. If, you do this he should get your undivided attention. It helps him realize that you really do care. I hope you find success with your son. I wish nothing, but the best for people who have the courage to take on children. They are a blessing. Anonymous, I am channeling my husband right now and thinking only of sarcastic comments. Mostly due to the fact that you chose to post anonymously rather than add any credibility to your statements by sharing who you are with me or these readers. I do not think this was a graciously worded reply nor do I agree with everything you wrote. My filter is the Bible and I believe if I raise up my children in the way they should go they will not depart from that way…which includes being a loving family member. My son is precious to me as I view him as a gift from God…he is NOT however the center of the universe or even the center of my life. I know that I will make mistakes in parenting…every parent does. That is why I am teaching him about grace and forgiveness now…so he can forgive me later. 😀 If I allow him to interrupt now then I am teaching him that he doesn’t need to respect others and that what he thinks is the most important thing. If he doesn’t respect others then when he enters the work place he will be a constant problem for his supervisors and they will fire him. If they fire him, he will move back in with me. And if he thinks he is the most important person and he is living with me then he won’t be able to meet a godly woman and get married. He will be 35 years old living with me…and eventually he will decide because what he thinks is most important and because I am old and what I think isn’t useful, that he should put me in an old folks home so he can have my house. Then he will lose my house because he doesn’t know anything about paying bills, like taxes and the IRS will take the house. Then he will either marry some crazy woman with 12 kids so he has a place to live or he will be homeless. I don’t want my son to be homeless.so I’m going to teach him to be a contributing, respectful member of the human race….I really don’t need another person in my life telling me I am “doing it wrong” or that I am “not enough”. God has been faithful in my life to bring into balance when things are off. Teaching a 4 year old a new skill sometimes takes time. We have been working on the interrupting thing. He spends every awake moment with me as I am a stay at home mom. He tells me everything and we have a lot of fun together. If he isn’t getting enough attention…well then we have other issues because I don’t have anything else to give. We have one-on-one time DAILY. The truth is interrupting is an issue for most preschool age children. Heck, I still have to work on not interrupting others when they are telling me something. We are a work in progress. I am a work in progress. LOL – you are a treat! Hey Lori, That was actually another reader’s response to a comment, not mine. Thanks for commenting though. Have a great day. (response to cbgrace) I think you took what she was saying the wrong way. I took what she said as you don’t want your child to think that you don’t care about what he has to say. In reading your original post I understand what you mean when your child interrupts you for no reason but to tell you something silly and unimportant. My kids do that too. But I would never tell them that what they said was unimportant. I think that she was simply trying to say that even if it seems silly and unimportant to you, it isn’t to them. Yes there is a time and a place and if they interrupt you 15 times to tell you something that is silly it can be frustrating. But, in my mind, you don’t want your kids to know that you think what they’re saying in unimportant ever, but to teach them that they can wait until your company has left and then you can talk to them (said child) uninterrupted. It’s all about perspective. If you tell your kids they’re smart then they will expect things to come easily because they’re smart. If you tell them they did a good job and really worked hard then they will know that if they work hard then can accomplish (almost) anything. I’ve read studies about this recently and just wanted to use it as an example, please don’t take it as me telling you how to raise your child and yes I do still tell my children they’re smart. I don’t know if it has occurred to you or not but, it sounds like he’s not interrupting you to get your attention but because he wants to be a part of your conversation and get attention from other adults as well. I am a SAHM to 3 children (4, 3, 1) and I’m currently pregnant. I have a hard time believing that you are with your child every waking moment and if you truly are then you are doing him a disservice. How is he to learn to be independent if you’re constantly there? How do you expect him to move out and go to college if he doesn’t ever leave your side? And, just out of curiosity, does knowing my name is Amanda really make a difference? I could have posted anonymously and it wouldn’t have made a difference. The reason I didn’t was because I don’t want you do discount everything I’ve said based on that alone. Amanda, this is a great example of judging a situation your really don’t know about. When I said I am with my son all the time..I meant it. 95% of the time, he is with me…why? Because for the last 3 years we have fostered-to-adopt him (adoption was final only two weeks ago). Fostercare has extremely rigid rules and we only had one two people who were certified to watch him. He was with us constantly because we were not allowed to drop him off at little Johnny’s birthday party or even allow him to spend the night at his Nana’s house. You see, where you see me as being a “bad parent” because I am not teaching him independence I see myself as not breaking the law or rules that would have had him removed from my home thus thwarting his adoption. See how judging other people’s situations can be detrimental. Since the adoption, he went over to my sisters one Sunday afternoon and it seemed so odd that he wasn’t with us. I do believe it is important to listen to my son. He is loved beyond measure. Here’s my situation…I have had it with people judging my parenting. Everyone has an opinion. I don’t know anonymous and I don’t know you…and more importantly, you don’t know me. If you knew my son, you would say, as everyone does, “What a good boy.” He is a good boy; people like being around him because he is polite, kind, loving, funny, and we think, pretty wonderful. We are doing most things right. As a parent, the best we can all hope for is to do the very best we can, pray a whole lot and hope we don’t screw them up too badly. May God be with you (seriously) as you stay at home with a 4 year old, 3 year old, a 1 one year old and one on the way….you have earned your sainthood. By the way…also have two infants. So I kind of have my hands full too. When I do get a chance to be around adults, I enjoy having conversations that do not involve dinosaurs, legos,and chewing with food in the mouth…just saying. And one more thing…when someone’s kid does drugs everyone judges the parents and their parenting skills but very few people look at the successful person and say, “What great parents you must have had”. Why don’t we start saying to our friends, families and acquaintance, “you are doing a great job” instead of “you’re not doing it right”. I don’t believe in God but Jesus said; “Let the children come to me.” He wasn’t diminishing their needs or excusing their thoughts as needless or silly. When you hide behind you god, I guess you can do or say anything and disguise it as holy. Wow, she (the anonymous commenter) wasn’t being discourteous at all, you (the commenter) are completely defensive and have made this article and yourself look bad. Her credibility is intact whether or not she chose to stay anonymous. I didn’t have huge problems with this but after reading your post all the things I did find concerning were solidified. Parents out there if you have chosen to bring a child into this world they are your complete responsibility and therefore should be the center of your world. Teaching children and people how to interrupt is important but it is more important for them to feel loved and important. Yes, amazing right, we should respect our children. Adults are not perfect and should be challenged when appropriate or else we do not learn and expand as people. Children should not be taught that they should only be seen and not heard. And they should not have to wait a long period of time for attention no matter what a parent is doing. That leads to self esteem issues and a miserable life. (in response to anonymous) I love my kids. My kids were chosen. If you would have read more of my blog you would know that. They know they are loved. They are going to know that they are valuable but they are not the center of the universe; they aren’t the center if my universe. Yet, I love them completely and have made extreme sacrifices in my life to be their mom. Also, this blog that everyone decides is a complete picture of my parenting…it’s not. It is a pocket of frustration. I’m allowed to complete a thought or sentence without being interrupted. And it’s getting better.plus, now we have other points of frustration…like math. I agree cbgrace. Some thing’s that little ones think is interruption worthy, aren’t. I have four. Two who are at that age where they interupt and then try to think of something to say because they really didn’t have anything to say to begin with. While we both might say to another adult that it’s silly we both know that we don’t tell our children that because we are loving parents. It’s disappointing that several other commenters don’t seem to pick up on the difference. I am also disappointed in the practice that we mommies have of breaking each other down for sport. You posted a comment that was perfectly acceptable only to be given unsolicited advice that, frankly I found uncomfortable for some one who clearly stated they don’t know you. Grains of salt or not. And wasn’t I further surprised to see others ready to do the same. Sigh. Why can’t we all get along? This mommy gig is hard enough without criticizing each other. One day I hope to have the free time and perfection that I can only assume others have. Until then, I guess I’ll just do my best and hope it’s enough. Keep your head up cbgrace, you sound like a great mom. I disagree with cbgrace, I thought this was really well worded! And honestly your comment is just what I needed to hear. Sometimes I feel like my son interrupts me just to get attention, and after reading this I think that both the interruption rule and your techniques go hand in hand. The rule is great, but unless I’m also giving my son a time when I focus just on him, I’m not sure how successful it will be. I’m afraid I’m not to worried about him thinking that he is the center of the universe because the interruption rule will still exist (Kind of a ‘duh!’ moment, I’m obviously ignoring him when I’m talking to someone else.) Any way, I just liked this, and thought it was a really great compliment to the interruption rule. Thanks! We arent giving children, of any age, enough credit. There is absolutely nothing wrong with teaching a child to wait their turn or to have patience. And yes, they will understand. No one has suggested shrugging them off, turning a deaf ear, or telling them to go away and that they are unimportant. And no one has mentioned physically telling their children that what they have to say is silly. What HAS been mentioned is an equal show of respect for each other. A gentle,loving, physical touch to let each other know that ‘i acknowledge what you’re doing is important and will wait’ and ‘Mommy wants to give you her undivided attention so let me finish up what I am doing’. Children are sensitive, they are emotional, they are sponges, and they are smart. They are perfectly capable of reason. I was taught this way as a child and NEVER felt neglected or ignored. I had an amazing mother who spoke to me and treated me like a person not an infant . She taught me self control and emotional stability. We had plenty of time for one-on-one conversation. Interrupting anyone is rude and inconsiderate, no matter your age. Since when has teaching our children manners become so taboo? One of the major issues with today’s society is the ‘me first’ attitude so many walk around with. This was not intended to teach parents a way to ignore their children or belittle them in any way. This was simply, a quite usful tactic, on teaching children manners, a level of repect, and to wait their turn; whether its a conversation between adults or with their peers. I agree with this very much. I think it’s important for children to understand that manners matter and that waiting for a few moments to do things the correct way is a lesson that everyone should learn. Too often I see kids who run wild and do not listen to rules put in place for their safety and often when you talk to the parents about this they do not see anything wrong with this behavior. But having this rule, letting thenm know that they can wait, but that their opinion still matters even if it is what an adult mind find silly or unnecessary is important. It helps foster imagination when the parents listen to the child’s stories about their bears adventures that day. When I’m not with my friends or not in a setting to be interrupted, sure I can sit down and ask my daughter to tell me all of her silly things…but unfortunately that’s not the way creativity is developed and it’s certainly not the way my kid-or the kids around me work. If I asked my kid to tell me all her silly things before I made a phone call, she’d look at me like I’m crazy. Kids are the most creative creatures..creativity or funny stories, or even questions don’t formulate on the spot, just cause mom is gonna be busy. Teaching a child manners, is an essential part of their learning and growing and I feel like kids today have awful manners! I think people who are replying are feeling attacked and coming off aggressive because of the way you worded everything. This, for example,” ..please don’t disregard a child’s want for attention…” This post wasn’t about how to ruin your child by not giving them attention, or ignoring them, it was about a pretty darn effective tool that I just implemented about 2 minutes ago that will make my child understand patience, and turn taking. I have silly things to say all the time..I still have to wait my turn, and I certainly was never disregarded. There is a time and a place. I stay home with him so he gets lots on one-on-one. Cbgrace, you are overanalyzing the situation. It is cruel to read that you think your son’s thoughts are silly. Poor child. Sometimes kids DO interrupt for no other reason than they feel you are giving to the other person. Also some children do this regardless of how much quality time you spend with them one-on-one. So he interrupts then really has nothing to tell you because he just wanted to stop you from interacting with someone else. I experienced this with one of my kids. This is not acceptable if you are having a conversation with another adult (at least it wasn’t for me). I love this rule for that exact reason. If you stop to tell the child not to interrupt you are doing exactly what they wanted you to do which is pay attention to them. I spent lots of one-on-one time with my kids and they STILL did this. I was a stay at home mom so when I did get to hang with my adult friends my kids needed to respect that. This is a great way to deal with interruptions. I was just experiencing this today. Can’t wait to try this tomorrow. Thank you so much for sharing. Telling the child that the information that they have to tell you is silly and “unnecessary” is the wrong message to send to a child! I am a mom and a teacher and there are better ways to address this issue than “funny” and “silly”. Maybe it’s something important – for instance, the dog got out of the house and is running in the street. Just adding my 2 cents, for whatever it’s worth. I think there is a difference between interrupting two adults to tell them that the dog got out and is running in the street (emergency!) and interrupting them to tell mom your favorite color is purple. Not to say one is more important than the other, but one is certainly more vital information for mom to know about *right now*. Your favorite color can wait for two minutes. How do you handle the dinner table? We say you have to wait your turn to talk, but 3 and 5 have a hard time waiting for the natural pause. ha, I suppose we were ahead of the times. We did this with our kids when they were younger as well…that was about 15+ years ago. Love it, worked great and now that they are almost adults they still do it…of course sometimes its a full on assault hug from the back, but they have learned well when it is appropriate to interrupt. Just found this on pinterest and stopped because this is exactly what my mom made me do when I was younger. I’m almost 18, and I tell you that it’s amazing. I stopped getting in trouble for interrupting (+++) and actually got to say what I wanted. Now, at almost 18, I really wish it wasn’t awkward to use this on my teachers/friends/mentors/etc… Although, in a sense, I do use it. I stand nearby, quiet, waiting for a chance to make eye contact, and wait. Very useful at music camp when I need to ask the director a question, but she’s talking to another student. Eye contact doesn’t mean to start talking, it means that they know I’m there and will get to me as soon as possible. Also taught me that waiting a long time is worth it for a meaningful conversation – I’d rather wait 20 minutes to talk to someone then 2 minutes to have 2 words with them. Using this, I’ve gotten to have meaningful conversations with the soloists at our symphony concerts, conductors, musicians… pretty much anyone. They’re people too, and if you’re willing to learn to wait until they’re free, you can have conversations with anyone! The concertmaster of the symphony here had a good 20 minute long conversation with me because I was willing to wait 5 or 6 minutes until he was done. Another thing we did was use “sign language”. I know ASL now, but when I was little, I made my own signs. A sign for computer, a sign for food, a sign for outside… stuff like that. My mom could be on the phone, and I could make the sign, and she could nod or shake her head. Worked brilliantly. I was taught to use a combination of ASL and made-up signs, too. That’s what I use with my nephew (5), now. I find it intrusive to touch to ask to talk, especially to touch a stranger to get their attention. That’s why we use signs and eye contact. Thanks Karen. A combination of signs and eye sounds like a great idea. Thanks for sharing. This is so good! Thank you for posting! When my 10yo “forgets”, I hover my hand over my arm to remind him that I will acknowledge his touch as soon as I get it, and speak to him when it is appropriate. Works great! My husband and I have used the interrupt rule with our 5 children. It really works awesome. I would recomend this for every family. Love the concept but am curious about how y’all differentiate when there is an emergency? Tell your kids to do jumping jacks if there’s an emergency. It really works great. My daughter started doing with her teacher this year , then she automatically started doing it at home . Best thing ever !!! This is a major issue in our home that we’ve not yet found a way to address well; this sounds like it will satisfy all needs. Thank you! I can’t wait to see how this works with my sister’s children and one day with my own! Thank you for the wonderful tip! So excited it has been working for you. As parents, I think we need a bag of tricks to pull from and this is one I was so thankful to come across. I glean little tricks from your blog as well. Thank you for commenting. Oh, I want to see her yellow Flip Flops! I am exhausted and I am not a single mom; so understand that you are doing an amazing job. You have already figured out to let the dishes wait, and that loving on your 4 year old after dinner is a more lasting investment of your time. You are telling her she is important which will build her confidence. But your kitchen still needs to get clean. My kids also want the validation of my attention. Maybe you could have your daughter dry some unbreakable dishes after you wash them, or spray down the table with water and wipe it with a cloth? She may love helping or mimicking you. It just might engage her long enough to finish the dishes? Set a kitchen egg timer for 10 or 15 minutes, and give it to her to watch. Make it her job to come find you when the timer is done so you can see her creations and get your dishes done! I have my kids “help” with chores. Sometimes it takes me 10 times longer to do something but if I really want to clean while they’re awake that’s the best way to do it. Mine are 4, 3, 1, and I’m pregnant. My one year old will hand me silverware from the dishwasher while I’m unloading. So first thing I do when I open it is take all of the knives so he doesn’t hurt himself. My 3 and 4 year old will push clothes into the dryer (we have the older model with the door that goes down so I pile them on the door and let them push them it) and then when they’re dry the will get them out of the dryer and together they can carry the basket into my room. They love helping (most of the time). I have a 5 yr old and 3 yr old. I’m definitely trying this! I found this on pinterest a while back, and I thought, “Nothing to lose, we’ll give it a try!” It’s working out really well, so far! Both my 4 and 6 year old are using it frequently and I’m much, much happier about their interrupting. THANK YOU! My kids are grown, now, with babies of their own, but I started this with them very early, right around three. It was one of the best tricks in our parenting bag! When I first implemented it, I used a marker and put a heart on my forearm where I wanted her to put her hand. The heart served as a reminder without more prodding from me (after the first few times). That worked very well. When she put her hand on me, I’d cover it with mine and make eye contact within a few seconds (without breaking my conversation). She was one who needed that extra confirmation that I understood she wanted to talk, that I wasn’t just being affectionate back! The eye contact was also important because that was when she could indicate an emergency by doing “jazz hands” by her eyes. Of course, if her baby sister had fallen into the toilet, all bets were off and she should do whatever it took to get my attention! We used this method until they moved out. Of course, by then, my husband and I were also using it to interrupt THEM (mostly on the phone). Courtesy isn’t only required of kids. Respect is one of those things that is modeled rather than demanded. Our culture, strangely, talks much more about respect than practices it. The car is difficult because the child must use his voice to get your attention unless you’re willing to trust him with a noodle to poke you! LOL Not likely! And if he decides to just yell anyway, you can’t easily get up and go somewhere else. But if you establish conversation etiquette at home, the car is much easier. However, the best trick I ever employed for sanity in the car was when I started reading aloud on car trips. I can’t read in the back seat, but I found I never get sick reading in the front if I hold the book up a little, not laying it on my lap. We saved adult-only conversations for elsewhere and as soon as we got settled in the car I’d pick up the current story and pick up where we left off. Even little ones can follow a story that has plenty of action. And, I swear, I never once heard, “are we almost there?” when I read in the car! Love the reading in the car idea! Thank you for he tip! Thank you so much for this comment. I was just about to ask HOW to implement this rule and I adore the heart on the arm idea. I think this is a good idea to have established rules and boundaries. We are the same when driving and children know when it is a good time not to talk (not by the same touch method though obviously). What a simple but great idea. I will definitely try this with my two when they are bigger and am pinning to my parenting tips board. Thanks so much for sharing with this weeks pin it party. Thanks Helen. It made such a difference in our family! Thanks for pinning. I’ve used this in the past but needed to reminder to re-implement. Thank you!!!! Yes, I wrote this post just after “reimplementing” the Interrupt Rule. I hear you. This is great, found it on Pinterest and already discussed it as an action plan with my 5 year old son who has a habit of needing to interrupt 20 times once I’m talking to someone!!! Oh my gosh. This is life changing. I have 4 kids and they all at some point interrupt but my youngest who is 5 is the worst. We will definitely have this lesson taught in our home soon. Kelly, it had such a dramatic effect in our home. We need refresher courses from time to time, but it is a fabulous standard. Great idea! I’m trying this with my kids! Thank You! You are going to love it Angee! Genius! Wish I had learned this while my kids were young, but I’m going to share it with my sisters and prepare for my grandchildren. I loved the “hidding while talking on the phone part”..haha. Me too. I really like your touching part. Great non-verbal communication! I LOVE this idea! My daughter is always repeating “excuse me mom” until I respond, which I sometimes can’t right in that moment. This is the perfect solution to teach her! Thank you for sharing at our Pinning for Play link party! I love this idea! It seems so simple…like I should have been able to figure it out, but I didn’t! 🙂 Have been trying to think of a better way to handle this with my little sons. Thank you! Will implement this right away. When in the car and the child is unable to “touch” you, is the only time little Susie is allowed to call my name…just once, I then raise my index finger so she knows that I acknowledge her, then when there is a natural break in the conversation, she then has her say! Hope this works…if anyone has anyone different, I sure would love to hear it! I LOVE this! My children are young adults now but I taught them this when they were little. I also have taught this to my kindergarten class every year. It works wonderfully! Great article and sound advice. My daughter taught me a good saying for those who interrupt when we’re talking – and adults do it all the time, too. She says, “Excuse me, but your stepping on my words”. I’VE even been reminded when we get into an excited or animated conversation. I love the touch and hold method for when you’re right there, and the other would work for when you’re on the phone. Thanks for sharing! Thankyou so much for sharing! I look forward to trying this out with my 3.5 year old who very politely says “excuse me”….but over and over! I love this idea. My 6 year old needs reminding all the time not to interrupt. I am going to try your idea. Funny you should ask. I go them on clearance at Walmart for $4. I really like a bargain. I wish all of my mom friends would read this. I can’t have a conversation with many of them. I taught this to my now 26,23 and 21 year old boys and teach it every year to my wonderful class of kindergartners. The parents are So appreciative. Some of the children end up teaching it to the parents. Thanks for spreading the word! Teach honor and respect to you children by practicing honoring and respecting them. I LOVE this and taught all three of my kids this new rule as soon as I found it on Pinterest yesterday! I am a new blogger (www.mondaylunchtrio.com) and we feature tips each week. I’m linking readers to your site for this great rule and more as my tip on Monday! I’ll also be subscribing to your site…so glad I found it! I am thrilled you benefitted from this! Thank you for sharing it with your readers. Congrats on your new blog. I will check it out. I love that Melanie! I really adore the arm around them/hug approach! Thank you for sharing. I love implementing silent signals for kids. I did this in my classroom when I was teaching. So much more effective than 17 3 year olds all trying to get your attention at once! When they’re interrupting you it seems to automatically put a stress on the situation and the minute you’re dealing with them you’re a little annoyed at being interrupted. A silent signal lets you initiate the interaction while letting them know they’re not being ignored. Love it! Keep meaning to tell you that we tried this and it has been great! Our youngest son hasn’t caught on but our 4 year old has and that’s something! Thanks for sharing this idea for a little parent sanity! Wow… My son constantly interrupt when he was 4 years old but it was in 2008, I just figured it out and asked him to touch my arm and waited for me to finish my conservation, then his turn to ask or speak with me. Until I saw this article, thought it was old thing, years ago! I’m glad that subject should have brought up for new parents. Thank you. Pingback: "The Interrupt Rule" By Allison Hendrix - Christian. Wife. Mother. Wow, I’m going to try implementing this with my 8 year old. He is constantly interrupting. This sounds like the perfect thing! Thank you. I don’t like doing this. I dont like being touched like this. Its more distracting than them interrupting. I don’t want to train my kids to touch someone without their permission either. Any other ideas? This reminded me of my Grandfather telling me children are to be seen and not heard. I had things to say, I was apart of the family but not really if I couldn’t express myself and I wasn’t a disrespectful kid. I had great manners and used them. So when I had my son, I made sure to tell him that he has needs and a voice to express them. I used the Love and Logic method which also teaches respect and character building by being responsible and respectful. I started using his toys as payment for my time above and beyond. I told my son when he goes to bed I am off duty and it is adult time, my time. If he gets up asking for water or looking for my attention he had to pay me for that time. His only commodity as a child and the most meaningful are his toys and the ones he plays with are the ones I target to get the lesson learned quickly. This kept me from getting upset at bed time when he wouldn’t go to sleep but kept looking for attention. The first night he had to pay me with three very important thomas trains. He got that I wasn’t playing around. I told him he could earn them back the next day by doing some chores. He went to sleep and the next day he asked what he could do to get his trains back. I had him dust the living room (I purchased a duster from the dollar store he could easily use). He was so happy with his work and happy to get his trains back. Night two, before I left the room he called me back in, from the look on his face I knew he wanted to do his usual routine, so I said, “Oh goodie, do I get more of your toys again?” He stopped and thought about what happened the night before and said good night, then rolled over and went to sleep. So when I needed to introduce this when I am on the phone it was quickly learned. My son usually didn’t have a need when I was on the phone, he just didn’t have my attention. He can get his own drink, snack and he knows if he’s bleeding that’s another matter. I have used the toy payment for not following the rules at the grocery store. I had to enlist a friend to come and get my son and baby sit him when he wouldn’t behave and he had to pay her with one of his toys for and do chores to get it back. This is a real life consequence to actions and he got this lesson as a toddler. My son has learned that when two adults are talking he needs to say, “excuse me please”. He has to learn to speak up for himself in front of others, peer and adults alike. It is respectful for say excuse me because they are proper manners, it is respectful to the adults and honors them and it also honors my son and gives him a voice. Since these are proper manners they are suitable in any situation. All to often I see children not being taught manner any more and adults that have forgotten to use them as well. I model these manner in public and to my son, I lead by example. I believe that is also a Christian way. You can’t keep trying to follow a plan for raising children, you can only do your best to instill the values you feel are important in them. This is best done using your own intelligence and empathy and, hard as it may be, improvise all the way. They won’t be who you thought they would be, so bolster their strengths and let them fall to their weaknesses with you standing below to catch them(don’t prevent them from falling). This is so true. Thank you for that. I find parenting the most humbling yet rewarding thing I have ever done. We need each other for support and encouragement. I’ve seen a similar idea that has the child put two fingers on their wrist where a watch would be to signal “time” – saying I need your time, or have something to say that takes time. My now 5 year old uses it (occasionally!) and I love it! Love it.. I’m using and sharing.. My youngest has ADHD.. everything is a now situation.. This will be great for us! I understand that oh too well. It has been a wonderful tool in our home. Pingback: 5 способов научить ребенка ждать без капризов — Знайка!